The Consulates are responsible for processing visas and permits for people wishing to visit their country and provide assistance and financial help to needy compatriots or other emergency. The territory occupied by the Embassy is own by the represented country. Its mission is to promote the interests of his country in the host nation, promoting friendly relations among the two countries, promote economic, cultural, scientific, etc, making state visits, both commercial and political treaties, among a number of other functions. If you look beneath you will see the Consulates in Burkina Faso and nearby towns that exist in our database diplomatic missions worldwide. The diplomatic mission and diplomatic agents have the privilege of exemption from all dues and taxes of the receiving country and duty-free importation of goods and articles intended for their use. They are also protected by this housing inviolability of diplomatic agents. 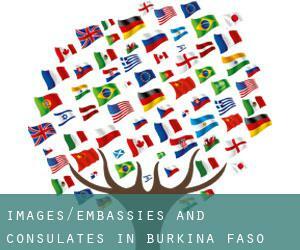 Overview the content of this page to get the address, phone and contact details of all the Embassies and Consulates in Burkina Faso and nearby cities. We're pretty certain that the staff at Embassies and Consulates in Burkina Faso speaks your language perfectly so you can expect to not have any difficulty communicating with them. Access to this section for a detailed listing of all Chinese consulates, embassies and representative offices situated near Burkina Faso. ConsulBy offers all Indian citizens with an updated and verified list of all Indian consular offices so they're able to contact them with any unexpected situation though in Burkina Faso and its surroundings. Have a look using this link a collection of all US embassies and consular offices placed around Burkina Faso, just in case you will need assistance while you're abroad. Check the Nigerian diplomatic mission in Burkina Faso, responsible for providing assistance and support to any Nigerian person while they're visiting the country. Access to this section for a detailed listing of all Russian consulates, embassies and representative offices located near Burkina Faso. ConsulBy gives all German citizens with an updated and verified list of all German consular offices so they are able to make contact with them with any unexpected circumstance although in Burkina Faso and its surroundings. Have a look working with this link a collection of all French embassies and consular offices placed around Burkina Faso, just in case you will need assistance whilst you're abroad. Check the British diplomatic mission in Burkina Faso, responsible for providing assistance and support to any British person while they are visiting the country. Problems with Burkina Faso authorities? Contact immediately with any of the diplomatic missions borwsed for Ouagadougou to discover the right answer with all the local authorities. Diplomatic missions are usually in populations with greater quantity of inhabitants. With 87.347 residents Burkina Faso is one of the most influential centers of population Burkina Faso. It is virtually impossible to visit Burkina Faso bypassing Bobo-Dioulasso (with 360.106 inhabitants). ConsulBy presently has an extensive catalog of Consulate and Embassy in Bobo-Dioulasso and surroundings. One of the busiest centers of population Burkina Faso is, without any doubt Ouahigouya with 61.096 inhabitants, making it a very good candidate to host one or alot more Embassy in Ouahigouya.